In the 14 months since my Blaze review, Fitbit’s fitness watch has continually risen in my estimation thanks to a handful of compelling new features. Also, Blaze was recently named the best wearable for corporate wellness programs, based on a new study from health analytics company Springbuk. So, if you disregarded Blaze in the past, it’s worth taking a second look — though note my word of caution at the end of this post. Blaze now has Fitbit’s recently released Sleep Stages and Sleep Insights. Sleep Stages helps you better understand your sleep patterns by segmenting them into four nightly stages: Awake, REM, Light and Deep. 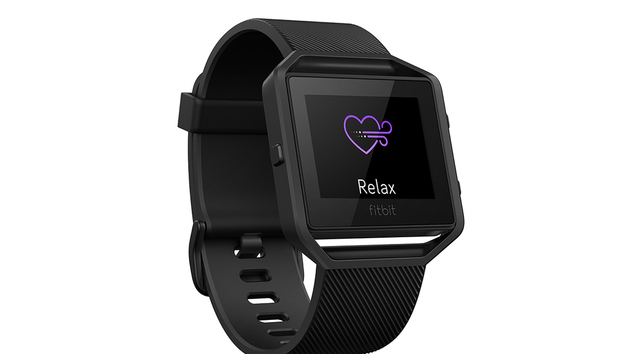 The data is displayed on Fitbit’s site as well as in its mobile app. You can see how much time you spent in each stage; how a night’s sleep compares to your 30-day average; and how it compares to other Fitbit users in your age/gender group. Sleep Insights, as its name suggests, delivers insights based on your sleep data. The insights are often helpful — did you know alcohol can impact how much REM sleep you get? But I wish you could add notes to each night’s sleep data, as reminders for what you did (or didn’t do) the day before that might have impacted your sleep. Sleep Stages is currently available only on Alta HR, Charge 2, and Blaze. Sleep Insights is available for any Fitbit device that tracks sleep. Introduced with Charge 2, Blaze now estimates your cardio fitness score, which is based on the VO2 Max standard. To get your score, manually record a run workout for at least 10 minutes, outside, on flat terrain. Alta HR and Charge 2 can also track your cardio fitness score. But only Blaze and Charge 2 can use your connected smartphone’s GPS to give you a specific score, such as 54, vs. a score range (such as 48-54), as you’ll get with Alta HR. As with Charge 2, Blaze now offers Relax mode, which will guide you through a 2- or 5-minute guided breathing session. The visual guidance looks great on Blaze’s color screen, vs. Charge 2’s smaller, monochrome screen. Blaze nudges you to get at least 250 steps every hour. You can customize the hours each day you want to receive reminders. For example, I’ve set up my Blaze to remind me to move every hour between 10 a.m. and 5 p.m. daily. Reminders to Move is also available for Flex 2, Alta, Alta HR, and Charge 2. When it was first released, Blaze displayed call text, and calendar alerts from your connected smartphone. Now, it can also show notifications from email and some other apps, including Lyft, Waze, Starbucks and The Weather Channel. Blaze isn’t a smartwatch per se; it’s a fitness watch with some smartwatch-like functions. If you’re really hankering for a fitness-focused smartwatch and aren’t interested in an Apple Watch, you might want to practice patience. Fitbit is expected to release a full-blown smartwatch this fall for approximately $300. Though Fitbit CEO James Park has confirmed the company’s smartwatch plans, the details haven’t been announced as of this writing.